Happiness at work: be a “digital nomad”? 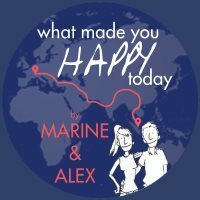 – What Made You Happy Today? After two weeks in Malaysia, we can already do a small check on the pace of our trip. We went fast, finally, in the different destinations we covered: 48h in Malacca, 24h in Kuala Lumpur, 4 days in Pulau Kapas, 2 days in Perhentians islands, 2 days in Penang. 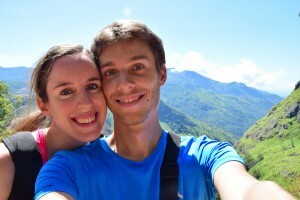 In Malacca and Kuala Lumpur, we stayed with local families and wanted to share the life of our hosts, which left us little time to settle and work. The purpose of this trip is indeed also to discover a new lifestyle through travelling while earning our living from day to day by working (especially remotely). In Pulau Kapas, the weak internet connection did not allow us to work normally, but in the Perhentians islands, for 3 USD we had internet for 2 days, enough to start a real update of this blog and begin funding our trip. Actually, we spend according to our budget: 33 USD for two per day, which respects our budget of 1100 USD for to two by month. And we do not have any other expense. Before leaving we have purged all small additional costs that we had in France and Singapore, and we have no more loan and no more apartment, so no more rent. Knowing that you do not spend any more cent than what you pay from your wallet is a pretty cool feeling to control what happens in your finances! In terms of revenues, Alex was able to work effectively (for his client Villa-Finder) in the Perhentians islands. However we move fast from places to places which makes it difficult to sit down and work in good conditions. On my side, I still look for my way to also contribute to our goal of balance or even financial profit during this year travelling. This nomadic life that we will experience during one year, some have made it a life style choice. They are called the “digital nomads”, because usually jobs in the digital are the ones that permit this lifestyle: web developer, web editor, translator … We envy them traveling the world freely and working from anywhere. Yes, some have really found their happiness in this working life style. For now, we like to think of doing this for a year, but the big disadvantage is that it involves working “alone”. The missions that allow working remotely generally lack of concrete exchanges with colleagues, and by concrete exchanges I mean real exchanges, face to face, and not on Skype from time to time. Alex needs this kind of exchanges that make him progress and allow him to brainstorm on ideas. As for me, I still do not know if it is essential to my happiness at work. But what is sure is that it is not suitable for everyone, otherwise there would be many more web developers on the roads. And you, have you ever wondered whether this lifestyle fits to you? There are also other ways to earn a living and travel, which consist in assuming that because you have earned enough money before you can enjoy things now. In his book “The 4-Hour Workweek”, Timothy Ferriss suggests to create businesses that are self-sufficient in order to earn revenues with minimal effort (the effort is done before!). And benefit of life to create a new self-sufficient business to take over from the first. By self-sufficient business, we can think of a web service: you have an idea, test it, develop the website, promote it, and once you have regular customers, you have revenues. Another example is also writing a book: thit takes great energy to produce it, but once finished it brings revenues. This is what Timothy Ferriss has been doing for years. Even if his writting style is not always very humble, I really recommend this book that opens doors to an alternative lifestyle where we do not save waiting a future retirement but where we enjoy life in the present. J’y ai déjà réfléchi, et j’y vois 3 inconvénients pour me permettre de m’épanouir. Le premier c’est le travail : il y a pas moyen d’être proche de la production matérielle de l’entreprise (s’il y en a une). J’aime bien les infrastructures donc j’aime bien pouvoir admirer ce à quoi j’ai participé pas loin de chez moi, même si au final tout ce que je fais c’est sur PC. Le deuxième c’est comme vous dites l’environnement de travail où on est toujours tout seul. Voilà, vous ça commence à vous séduire ou y a toujours les petits problèmes dont vous parlez dans l’article qui vous bloquent ? On ne sait pas encore trop si on tiendrait des années comme cela ! J’aimerais bien trouver une activité qui me permette de travailler à distance comme Alex, ça pourrait fonctionner alors. Je ne sais pas encore quoi, je cherche ! Pingback: Meeting with Mod : Or truly love what you do – What Made You Happy Today?